It’s nearing 5:30 a.m. when Kyeon Ford arrives at Reagan National Airport just outside of Washington, D.C. It’s too early for any daylight to wash across the sky, but nervous energy has the 15-year-old high school sophomore awake and ready for the day. With a fresh passport and e-ticket, Ford prepares for his first plane ride and travel outside the country – to Jamaica. But it’s no vacation. On this trip, he will be building homes for Jamaican families in need. "I worked on four houses, putting studs up on the sill plate and putting up a lot of the wall panels," said Ford, who tapped skills gained at the Academy of Construction and Design (ACAD), where he focuses on carpentry. He easily describes the sill plate, in this case, a two-by-four that goes between the foundation and wall of the house he helped to build. Ford is one of two ACAD students enrolled at IDEA Public Charter School who were chosen by teachers and staff to travel to Jamaica Feb. 17-20. Ford and Kayla Fleming, a junior, were among a pool of eight students first nominated by their ACAD teachers for academic excellence, class participation and school citizenship. Both are honor roll students who surpassed the minimum “good standing” grade requirement of 2.0, or C, according to Academy Director Shelly Karriem. Ford holds a 3.34 while Fleming has a 3.74. Krystal Boone, an instructor at the Academy of Construction and Design, said both students are standouts, embodying the qualities of leadership, organization and dedication of service to others. These traits made them good choices for a service trip to help those less fortunate than themselves. Ford has participated in the ACAD Summer Academy at IDEA. Boone praised him for his “great leadership skills” as the onsite project manager. “He made sure when I gave him a task to do, it got done,” she said. Boone credits him for leading the Adopt-A-Neighbor program, for which students cleaned up the yard of a 90-year-old Deanwood resident, and helming the Unpack Initiative for transitioning materials from the Academy’s move to IDEA. He also worked on the Academy’s tiny house construction project. 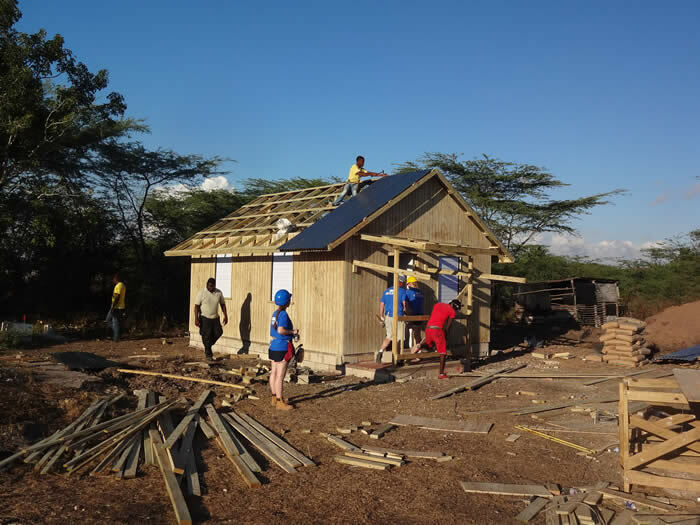 The students landed in the capital of Kingston, Jamaica with one goal at hand: complete the build of 16 houses in two days. Ambitious, yes. Impossible, no. First, they visited a local school and an orphanage for kids with special needs. Fleming admitted being both “nervous” and “overwhelmed” at the orphanage, but it didn’t deter her aspirations to one day work with special needs kids. She has four special needs siblings whom she looks out for at home. 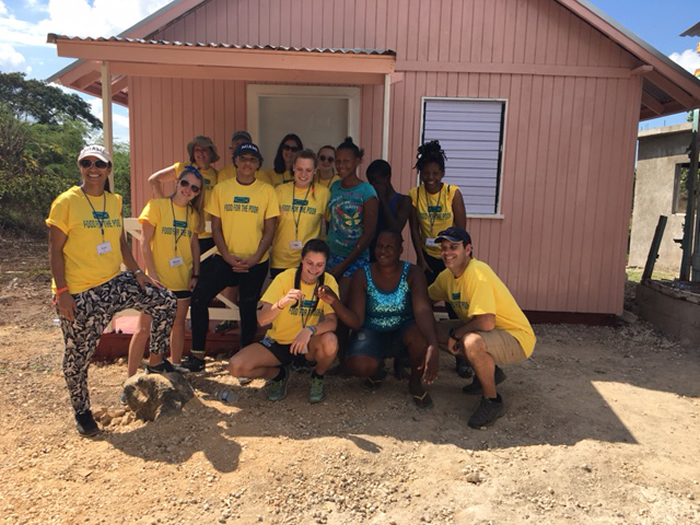 WORK IT OUT Kayla Fleming (far right, standing) poses with fellow volunteers after painting and completing new home for a Jamaican family. “Since I was very young – about 5 years old – I’ve had to deal with someone with special needs. My older sister, I’ve always had to help her – it’s my lifestyle,” said Fleming, 16. Karriem and her students then boarded vans and headed to an area known as Clarendon. There, they met one of the families whose house they would be rebuilding the next day. She recalled the homeowner being “very open,” inviting them into the house despite its poor condition: “She said we would have to follow her step-for-step, because if we stepped someplace else, the house could very well give way under our feet.” In Karriem’s office, a turquoise blue and yellow miniature replica of the simple wood and corrugated metal structures is a reminder of that trip. Poverty rates in Clarendon parish stand at roughly 19 percent, based on the latest data reported by Jamaica’s Ministry of Economic Growth and Job Creation. It’s poverty that doesn’t go unnoticed. Ford remembered many of the houses being dilapidated, with rusted metal sheet roofing and holes, and parents and kids living together in one small space. “A lot of their housing had cloth hanging because they didn’t have a traditional door,” he said. Seeing the families there, Fleming realized how much they cared about each other despite not having money. “Home is not only a place, but it’s about the people that you have,” she said. The new homes would still be basic – but they would include doors, a kitchen and bathroom, loft area and a living space. “For some, this is the first time they’ve ever had plumbing,” said Karriem. She estimated each house at 400-square feet, built from a mix of two-by-fours, concrete, plywood and corrugated metal. And the concrete was mixed by hand. 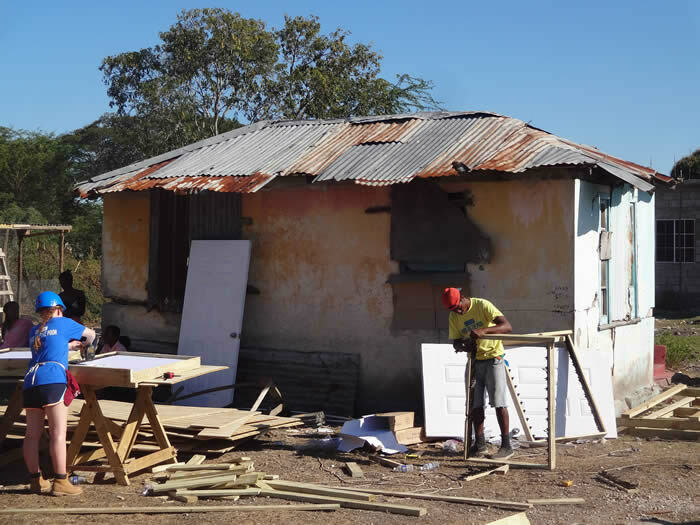 The Jamaican construction experience proved far different – and more straightforward – when compared to that in the United States. But that doesn’t detract from the grit and hard work put into the project. The outreach would be a team effort.Those with the Academy were among the 48 volunteers – including families and students primarily from the Washington, D.C. metropolitan area – that had traveled to help the residents living in this parish, which rests on the island’s southern coast. The fishing village of Portland Cottage served as home. There were no luxuries: volunteers slept in dorm-style cabins and took cold showers. Six- hour-plus days starting as early as 8:30 a.m. were the norm. By day one of the build, according to Karriem, eight houses had already been assembled and awaited painting. Four had the concrete foundations poured, and were ready to build. And the final four had been prepped for concrete to be poured for the foundations by the masonry crews. Ford worked on the carpentry crew. Fleming hustled on the painting team. 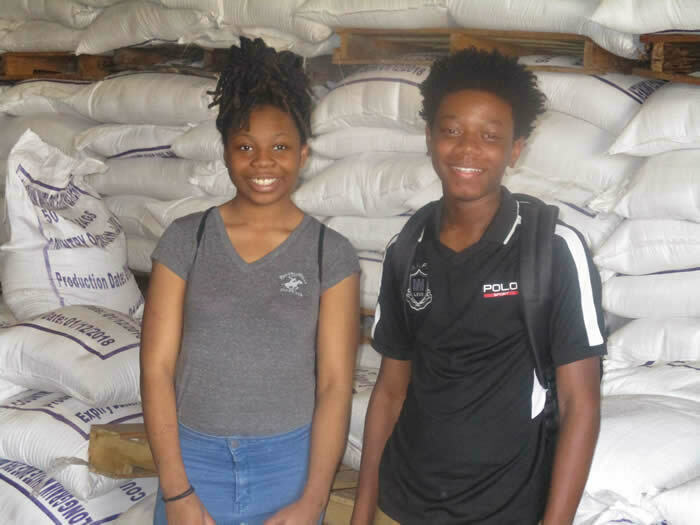 FOR A CAUSE (l-r) Kayla Fleming and Kyeon Ford visit a warehouse filled with pallets of white rice during the Ruppert-Davitt homebuilding trip with Food for the Poor. “The first house was the hardest house because I didn’t know much of what was going on. But it got easier as we continued to go through,” Ford said. 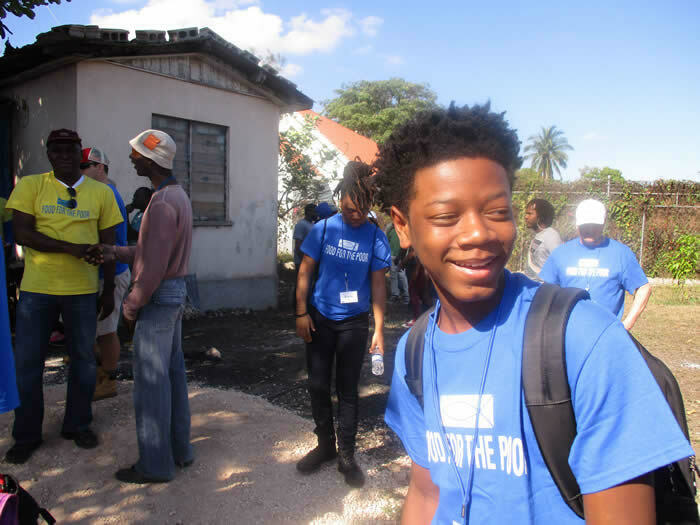 This is the second time Academy students have traveled to Jamaica for the building project. In February 2014, ACAD graduates Tremayne Chatman and Aunyee Waller helped build a school in St. Elizabeth Parish. These mission trips are positive experiences for Academy students. Each trip is made possible by a collaboration between Laytonsville, Md.-based Ruppert Landscape and the international relief organization Food for the Poor. “You’re enlightening these students and showing them the rest of the world, you’re helping the poor in Jamaica,” said Chris Davitt, former president of Ruppert Landscape, who has organized more than 16 of these service-driven trips with the company’s CEO, Craig Ruppert, over the years. The Academy got involved with the Ruppert- Davitt homebuilding trip after Craig Ruppert approached John McMahon of Miller & Long Concrete Construction about the trip and the possibility of ACAD students getting involved. This year, Ruppert Landscape sponsored the two Academy students, while McMahon sponsored the director and gave a donation. It cost $1,450 per person for airfare, lodging and food. Meanwhile, Ruppert Landscape raised more than $100,000 during its September 2016 fundraiser to help finance the latest trip, covering building materials, well drilling and other costs for the 16 completed homes. Davitt praised the Academy students for having “great personalities,” making “you feel good about today’s youth,” and the work ethic these young people have coming into the construction industry. He witnessed this firsthand, watching the students on the job site and seeing them use the skills they have developed in ACAD. A FAMILIAR SIGHT Homes with metal sheet roofing, concrete walls and cardboard coverings. “They are meeting the people who are moving into these homes they are building. They are seeing the impact that it makes. And they can see the impact of their trade,” Davitt said, noting that the exposure to travel also enables students to see that they are still fortunate compared to others in the world. IN PROGRESS One of the new houses under construction. Despite different backgrounds, there is a shared purpose: helping the people of Jamaica. For Ford, the opportunity has also made an impact. Since returning, he’s declared being more fiscally responsible by budgeting the money his parents give him. “I used to get $20, and in three days, ask for more,” he said. “Now, I hold on to it and keep it until I really need it.” His new money attitude had his parents questioning whether something was wrong, he added with a chuckle.